Belize’s tranquil island getaway of Caye Caulker floats gracefully atop the glistening aqua and emerald waters of the Caribbean Sea. Surrounded by swaying palm trees and rustic boat docks, the shores of Caye Caulker lie just a few hundred meters inside the second largest barrier reef in the world. The reef’s coral formations shelter a clear, shallow canvas of water that takes on an ever-changing array of multi-colored shapes and hues. If you can pull yourself away from the transfixing Caribbean waters, when you set foot on the shores of Caye Caulker, you’ll quickly get a sense that the island moves to its own beat, fitting its well-deserved billing as the tranquil, laid back member of Belize’s northern cayes. 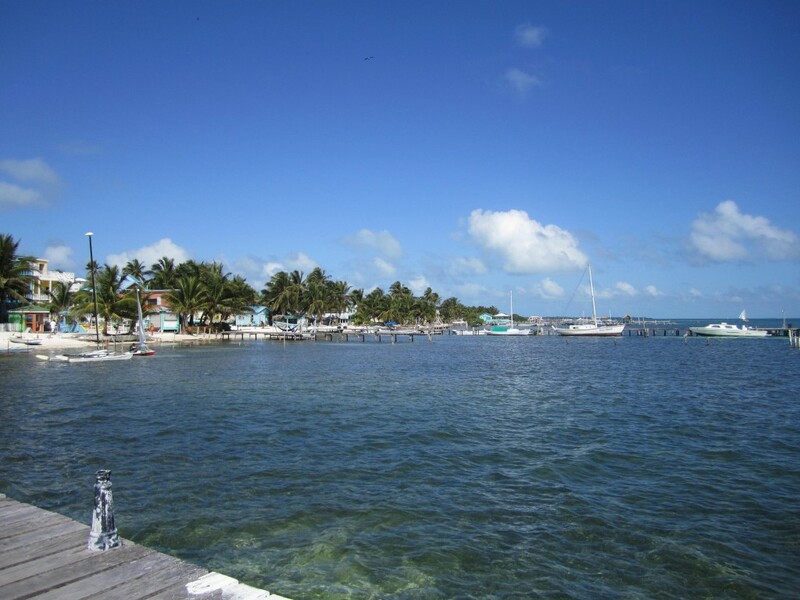 Caye Caulker might be described as lightly developed, with just enough business establishments and services to make for a comfortable vacation without jeopardizing the local culture and authentic tropical island atmosphere. Front Street runs parallel to the coast on the reef side of the island. 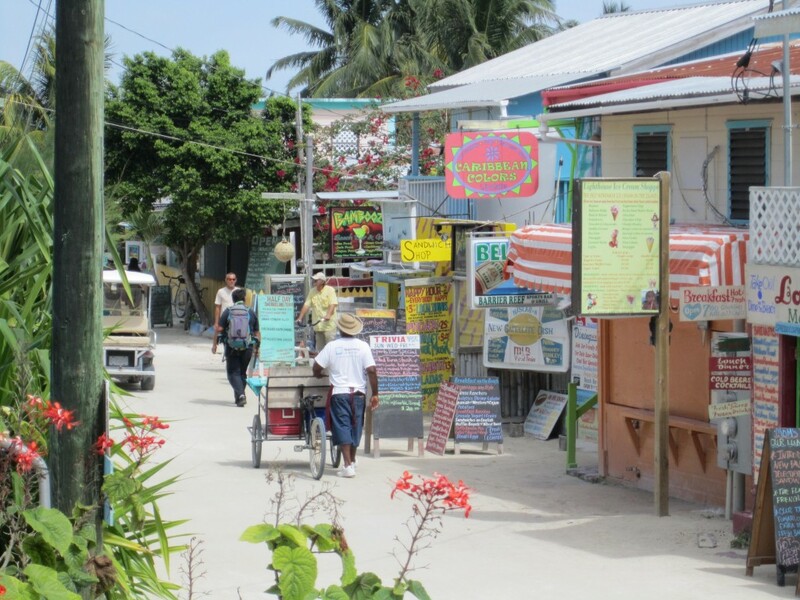 The Champs-Elysees of Caye Caulker, Front St. offers most everything you’ll need during your stay, from eating establishments to guides and tour operators to souvenir shops pedaling anything from t-shirts to tiki statues. A leisurely stroll down Front St. gives you a chance to take in the local scene, browse for souvenirs at the many road-side stands, plan tomorrow’s adventure, pick up a fresh pineapple or mango, or just get a better feel for the neighborhood and your fellow travelers. Locals and visitors alike make their way mostly on foot or by bike along Front St. and a couple of other unpaved, lightly traveled main thoroughfares. While a limited number of tour operators, taxis and natives get around on golf carts equipped with dune buggy-like wheels that would be right at home on a world rally track, a ban on cars helps preserve Caye Caulker’s relaxed, care-free vibe. 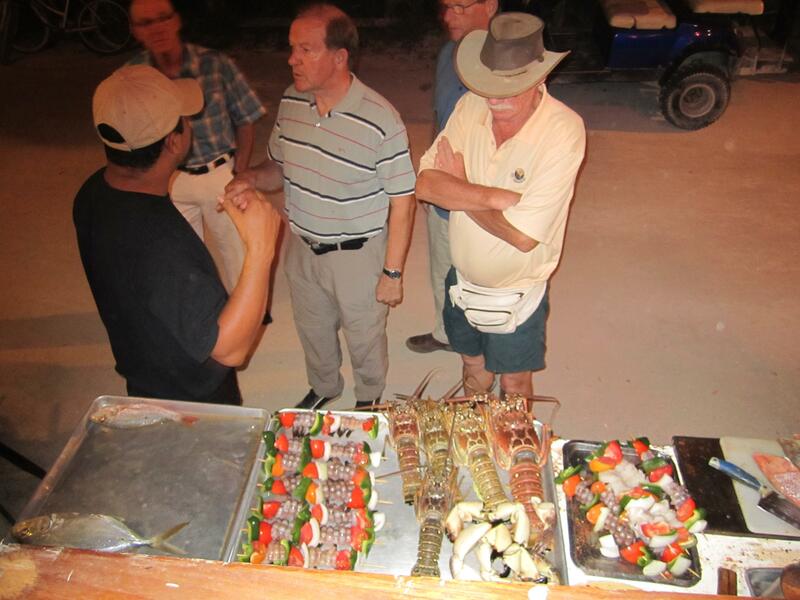 If you make it to Caye Caulker during lobster season, you’ll have your pick of any number of places displaying the day’s catch, just ready and waiting for a spot on the grill. On the beach just off Front St., Femi’s offers a tasty bargain that’s hard to beat, with a whole lobster, two sides, rum punch and a slice of homemade chocolate cake going for a cool $25 Belize (that’s $12.50 US). If you’re in the mood for a bit cozier, more refined atmosphere and don’t mind spending a little more, you can wander north a few blocks to Don Corleone on the other side of Front St. This charming little Italian gem serves everything from delicious lobster to homemade gnocchi and pizza. If you feel like meeting your dinner before it shows up on your plate, Rosa’s on Dock St. draws passing crowds of on-lookers who stop to admire or select from a fine display of fresh lobster, fish kabobs, and other local delicacies. We went with a medium-sized lobster and the best filet of fresh-caught grouper, or probably any fish, we’ve ever tasted. The picture below shows the scene in front of Rosa’s, complete with the next round of lobsters on deck. The pricey big boy on the right seemed to have a knack for steering clear of the fire as we kept tabs on the proceedings from our patio table just above. 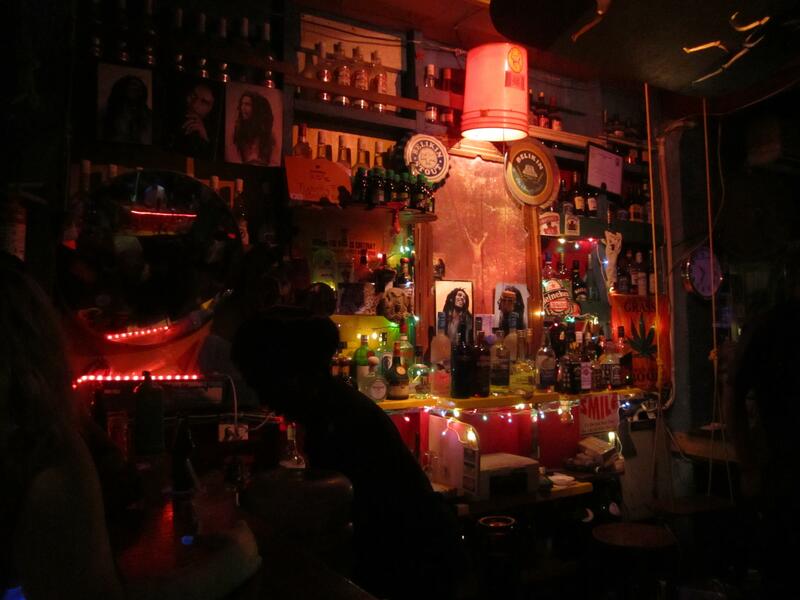 The I&I Reggae Bar, equal parts chill out spot and Bob Marley shrine, is a good place to experience Caye Caulker’s element of Rastafarian culture and reggae cool. One step inside and you’ll know the memory of the late, great Mr. Marley is safe and sound as long as this place is in business. Around the main floor bar, aka Temple Marley, wooden swings suspended by rope (no doubt made from hemp) take the place of bar stools. A DJ booth and small, artfully lit dance floor occupy an adjoining room. Past the dance venue, a door and staircase leads up to a large, comfortable, if a bit rickety outdoor deck that seems to be a favorite night time hang out for locals and visitors alike. While the good folks at the I&I are more than happy to serve up a Belikin, we suggest taking advantage of the opportunity to channel your inner Rastafarian and ordering one of the house’s special concoctions – you guessed it – the Bob Marley. To the best of our recollection, the beverage honoring the great Buffalo Soldier is a well-shaken, easy-to-drink little thirst-quenching number made from unknown parts rum (what else), coconut milk, coffee liquer, and some other pleasant stuff with a zesty, lemony tang to it. Whether you’re working off the after-effects of one-too-many Bob Marley’s or just getting ready for an early or mid-morning adventure, Caye Caulker offers plenty of good spots to start your day off right. The Sand Box at the corner of Front and Dock Streets, aptly named for its sand floor, serves a full selection of breakfast offerings, from tasty burritos to lobster omelets and puffy, air-filled fry jacks, a local specialty. Covered picnics tables out back let you enjoy your morning meal while keeping up with the local traffic around the dock for the Caye Caulker water taxi and enjoying a clear view of the Caribbean Sea shimmering in the morning sun. Just around the corner, the front porch at Amor Y Café lets you take in the scene on Front St. while enjoying a coffee and some lighter fare. If you get the chance, we highly recommend taking advantage of a few of Caye Caulker’s enticing options for authentic, homemade street food. If you’re on the go or don’t mind take out, the little one-man taco stand near the corner of Front and Dock Streets is a great place to pick up a quick bite for breakfast. When we stopped by, there was only one kind, more sauce than shredded chicken, but with its thoroughly delightful flavor that made for maybe the best taco we’ve ever had, we saw little reason to question the need for anything else. You can opt for a smaller corn tortilla for $0.50 Belize ($0.25 US) or go all out for the larger flour tortilla at $1 Belize ($0.50 US). We made sure to take full advantage of the chance to snorkel in the warm, clear waters of the Caribbean Sea on a half-day trip to several spots nearby Caye Caulker and a full day trip to Hol Chan, Belize’s most well-known spot for snorkeling and diving near San Pedro and Ambergis Caye. 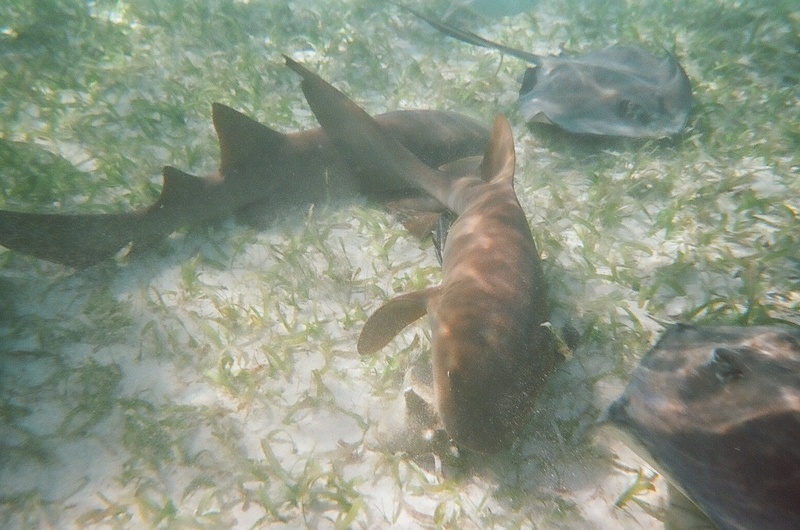 Both trips offered plenty of opportunities to get close to a wide variety of the Belize Barrier Reef’s fascinating marine life, including nurse sharks, stingrays, sea turtles, and loads of beautiful, irridescent tropical fish. On one of our stops near Caye Caulker at a local version of the more famous Shark Ray Alley by Hol Chan, there were so many sharks and rays that we could hardly step out of the boat without landing right on top of one. Once in the water, they proved to be every bit as friendly and unafraid, swimming within a few inches of us from all directions. Caye Caulker and the Belize Barrier Reef support a healthy cottage industry of snorkeling and diving guides and other tour operators. Most of them operate small shops on Front St., with a few others on Dock St. We had great experiences with two outfits, Anwar Snorkel & Tours and Tsunami Adventures. Both of our licensed guides were very capable and courteous, while having different personalities and approaches that helped make each trip distinct and rewarding in its own way. Each one seemed equally intent on making sure our trips were both very enjoyable and safe. Our hotel, Seaside Cabanas, and the guide offices took care of all the arrangements, making each outing as effortless as it was entertaining and memorable. 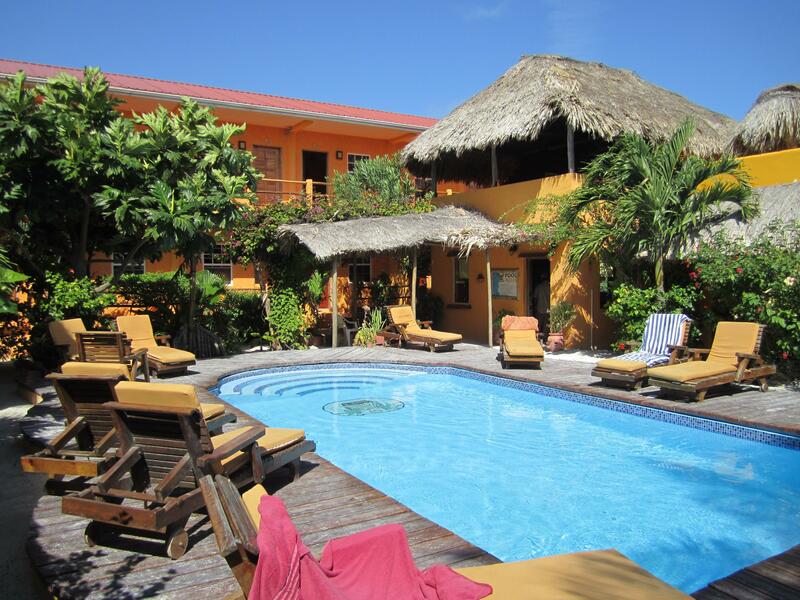 There’s no shortage of lodging alternatives on Caye Caulker. The many options range from hostels to mid- and upper range hotels to more private accommodations in rental cottages and condominiums. The majority of hotels and other places seem to be located on the reef side of the Caye, which fit our preference for being closer to Front St., the reef, guide boats and water taxis. Based largely on the many favorable reviews from TripAdvisor and Lonely Planet, we ended up going with Seaside Cabanas and were very happy with the choice. Seaside has a great, convenient location on Dock St. close to the Caye Caulker water taxi, about a half block or so off Front St. The hotel itself is an attractive, royal gold complex with a beautiful pool facing the Caribbean Sea and a charming bar with its own rooftop lounge. 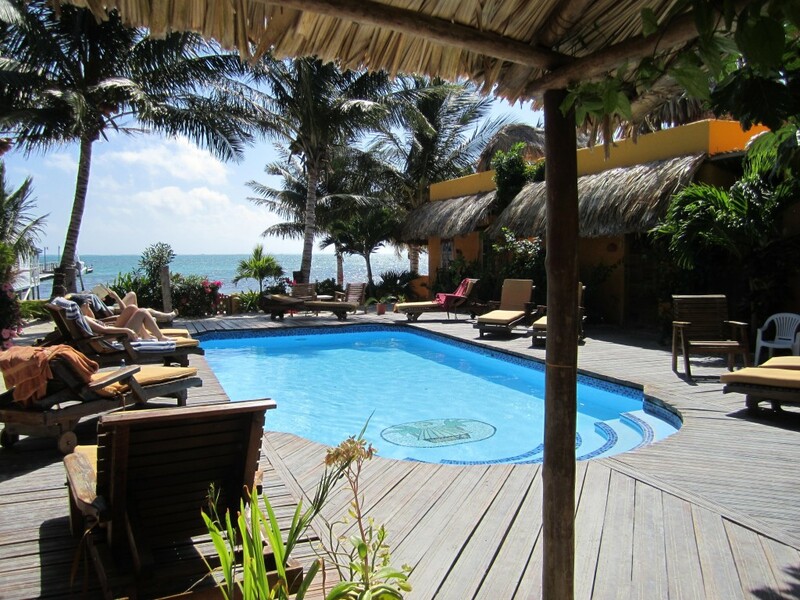 If you have a chance, you might try to get one of the great cabanas, which offer additional room and privacy, larger beds and a private rooftop that comes complete with a hammock sheltered from the sun by its own thatched roof. The hotel staff is a close-knit group, many of whom are related, which helps make for a friendly, family atmosphere. All of them were very accommodating and more than willing to help with everything from outing arrangements to room upgrades and extra towels. 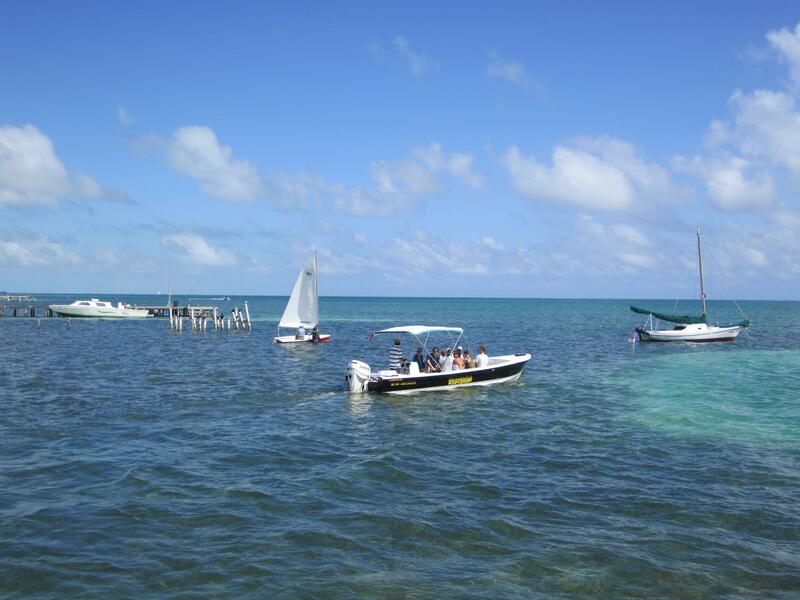 The only way to reach Caye Caulker is by boat or plane. 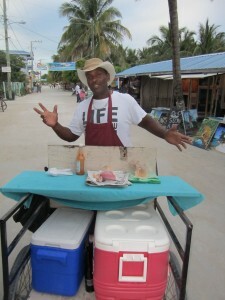 We took the Caye Caulker water taxi that runs from Belize City to Caye Caulker and on to San Pedro on Ambergis, Caye. 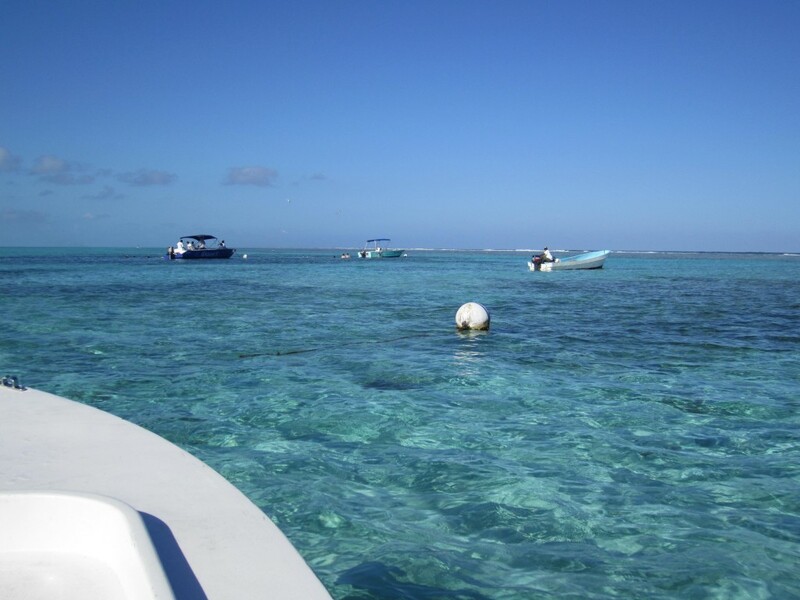 The taxi takes about 45 minutes to an hour to cover the 21 miles of beautiful Caribbean Sea from Belize City. Along the way, you’ll get to see a range of other idyllic tropical islands that pop up out of the glistening turquoise waters. If you’re traveling by water taxi, keep in mind that the last boat leaves pretty early by about 5 or 6 pm. If you’re like us and don’t always fare so well below dock on the open water, keep an eye out for a Caye Caulker water taxi that offers a place to sit outside. No matter how or when you arrive, you’re sure to have a great experience exploring beautiful, laid back Caye Caulker and the many natural treasures of the Caribbean Sea. Click here to go to the Global Sherpa home page.